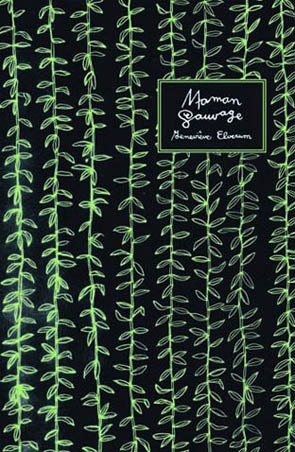 Maman Sauvage is the first book of poems by the artist known as Geneviève Castrée (and also as Ô Paon in music). She signs her poetry Geneviève Elverum, her real name. Rough and tender poems that translate the experience of nine months of pregnancy. Revolt, love, trust & angst, it all here in glorious french. Poems (french only), cover drawn by the author. 76 pages. 19,5 x 12,7 cm. 600 copies. November 2015. Pamplemoussi is Geneviève Castrée's third book for L'Oie de Cravan, a 68-page 12x 12 inch graphic tour de force presented in a limited edtion of 800 copies with a silkscreened color cover and includes a 12" lp of her songs! Graphically this is certainly her most accomplished work to date, the huge size of the book allowing her to get into crazy details that explode on the page. The book translates the 8 songs of the record into images. And this record is no comic-book-artist-trying-to-sing things. After much touring under her musician name of Woelv, Geneviève, with some help from Run Chico Run and Phil Evrum of The Microphones, has developped a unique and strong style. Something of a francophone Chan Marshall with some Bjork inflections. But forget comparaisons: you have to hear it really. Included are lyrics in French and English. 68 p., 30 x 30 cm, June 2004. Bande dessinée. Conte sans texte en neuf chapitres par l'auteure du fameux Nausea. 48 p., 16,5 x 21,5 cm. Trois premières éditions épuisées. OUT OF PRINT. David Cantin, Le Devoir (Genève), 8 septembre 2001. Images. Color cover, Inside in red and black. 58 p. on ivory paper, 6,5 x 5,5 cm, First edition : july 2001, out of print.